There are many plugins available for WordPress, which is by far the most popular content managed system. If your looking for plugins to help your websites SEO , then the SEO rank reporter plugin is one that we at Specialist SEO would highly recommend, it provides you with an efficient and simple way to see how well your sites ranking on a daily basis. Making tracking your website or multiple websites an easy task. There are many nice things you can do with the plugin, we will cover some of the basics so you can see the effectiveness of the plugin. Once you’ve installed and activated the plugin there are a few things you will need to check before starting to track your keywords. Firstly set your country’s version of Google in the settings section of the plugin. This page will also give you the opportunity to set up automated emails meaning if its only big ranking changes you want to be informed about then you won’t have to keep logging in to check the changes. 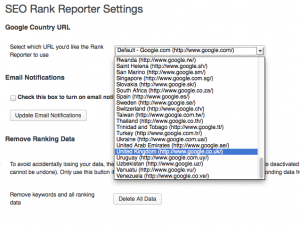 Once you’ve ensured your using your countries version of Google you can then add keywords, you will tell the plugin which keyword you are looking to rank for and which page you are looking at targeting with this keyword. Once you have had the plugin installed for sometime (if tracking the site itself) then it will suggest keywords for you based on previous searches where your website was shown in the search results – a useful tool for picking up additional search terms for your content. 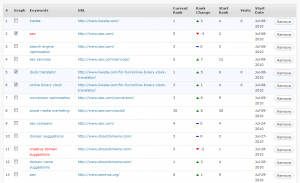 The plugin automatically updates every 2 days, but there is the option to check the ranking there and then. You can only check once per day though, which is not really an issue. All your keywords are listed, showing you the progress of there ranking position and the progress between the current date and the date they were first added in a nice format which makes it easy to compare and contrast. You can view how many people have visited your site for particular keywords, it compares the rank of your website to the number of visits overtime. Overall the SEO rank reporter plugin although not always 100% accurate gives you a great idea of the overall progress of your SEO campaign. Enabling you to see when your heading in the right direction with your campaigns. There are other plugins available to check rankings but none of them seem to work as well as this plugin, with results being inconsistent and not considering your regional version of Google and personalization. There are a few things that could be done to make the plugin completely perfect, here are a few things we would love to see from the plugin. The ability to bulk add keywords to a campaign, it can be time consuming when you have multiple keywords and have to add them in individually. The ability to sort keywords into groups or sites. Having the plugin remember when the keywords are ticked for next time, this seems to be a little inconsistent.